Did you know - you can now "Ask George"? 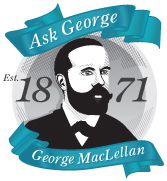 MacLellan Rubber Limited continues to develop and expand its web based customer service portal and as part of our 140th Anniversary celebration year, today announces the successful launch of its Interactive Knowledge Base Ask George. Originally conceived as a static, technical vocabulary web page the Management and Sales Team at MacLellan Rubber quickly recognised the opportunity for this to be developed into an Interactive Knowledge System offering a near human response to those questions we all have about Rubber Sheeting, Technical Terms, Abbreviations etc in the industry. The MacLellan Rubber team are recognised for our technical expertise and problem solving abilities, and we are regularly asked the same question by customers and product users. This facility will allow most customers and product users to obtain a quick and consistent response to their technical or application question. We are attempting to make the Knowledge Base as comprehensive as possible from day one and will continue to build and expand the system over the coming months and years, to ensure it keeps pace with the constantly evolving product range within our industry. The online system will provide an appropriate response to the question posed and provide suggestions for materials which may be suitable where appropriate. MacLellan Rubber was founded by George MacLellan in 1871 and we wanted to recognise his contribution to the industry and our business, all be it was tragically cut short with his death in 1880 whilst on a sale tour. Who better to be the face of our new MacLellan interactive service. To use the knowledge base simply enter your question or query in the Ask George box on the left hand side of the screen. We hope George will both educate and inform.